To mark the 25th anniversary release of the greatest British gangster film ever made Martin Howden goes for a boat ride with director John Mackenzie. In The Long Good Friday, Harold Shand takes a group of businessman on a luxury yacht over the Thames to entice them to invest in his scheme to develop the run down Docklands area. 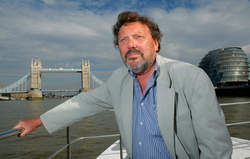 With Tower Bridge looming behind him, Shand holds his audience’s reluctant gaze and starts to speak. ‘Ladies and gentlemen. I’m not a politician; I’m a businessman with a sense of history. I’m also a Londoner. Our country is not an island anymore. We’re a leading European state. I believe this is a decade where London will become Europe’s capital. Having cleared away the outdated, we’ve got mile after mile, acre after acre of land for our prosperity. Twenty-five years later and The List is granted an audience with The Long Good Friday director John Mackenzie on the same boat ride that Shand took. His words ended up being extremely prophetic, where once the London docks were desolation, now stands skyscrapers, luxury houses and renovated warehouses. ‘We actually made the film before Thatcher came to power but there was a feeling in the air. A really strong feeling. It was like “We want to make money man”,’ laughs Mackenzie. The Long Good Friday 25th Anniversary Edition is released Mon 18 Sep.